Thanksgiving? Not to worry! We have many options to keep you warm - especially ones favoring the turkey, butternut squash, and tasty Ethiopian injera. Here are ways to keep fat and happy, giving back to local businesses and the community, this Wednesday through Friday. Oh, and Happy Thanksgiving! Food Co Op. Photo by Maria Gotay. 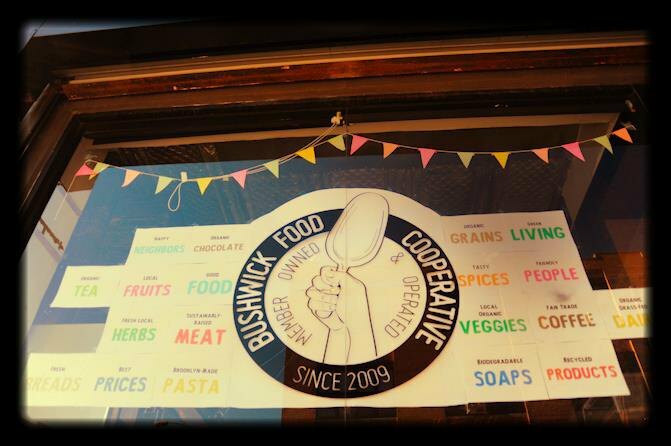 The Bushwick Food Co-op has everything you need to cook your own (sans-turkey) Thanksgiving feast including fresh cranberries, lots of greens, mushrooms, white sweet potatoes, garlic, squash, and more! They'll be closed Thursday and Friday, so head over on Wednesday between 3-8pm. Also check out their website for some spot-on recipes. Nets serving up Thanksgiving last year with St. John's. Photo from NBA.COM. Off on Wednesday but no travel plans in sight? Do yourself an the community a favor and volunteer your services with St John's Bread & Life NPO and soup kitchen (who you may have seen giving information at the Bushwick Block Party last summer). The altruistic organization will be serving hot chocolate and a Thanksgiving meal to those in need. Show your gratitude and lend a hand to serve the estimated crowd of 3,000 who will bring their appetites. 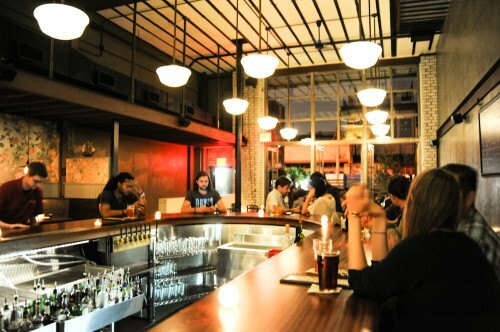 Meet at 795 Lexington Ave on the Bushwick / Bed-Stuy border. You might even run into some Brooklyn Nets players! Mominette's food is TO DIE FOR. Photo by Maria Gotay. 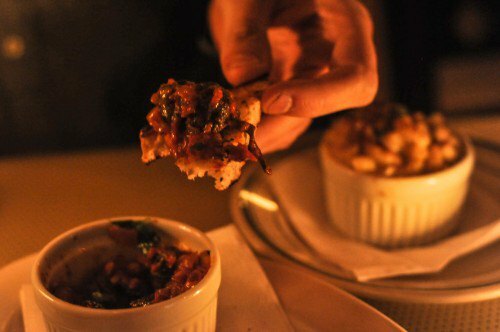 Bushwick's finest French bistro, Mominette, will be serving a prix fixe (that's 'fixed price' for you monolinguists) meal on the special day itself. New Chef Michael Arrington will be serving roast turkey, roast ham, mac and cheese, yams, corn bread, cranberry sauce, and a marinated kale salad. To top it all off, they'll dish you up a slice of pumpkin pie. All for the low, low price of twenty bucks. Ahh, The Rookery.Photo by Maria Gotay. The Rookery, a relative newcomer, has already wormed a hole in our hearts by dishing out some stellar hot rummy cider, and no one can resist their sloppy joe, but now you can also shirk off some familial duties without missing out on the home cooked meal. On Thanksgiving day they'll be serving up a bona fide feast, and they'll be lubricating your intake valve with drink specials all night long. Bunna's Thanksgiving Announcement. 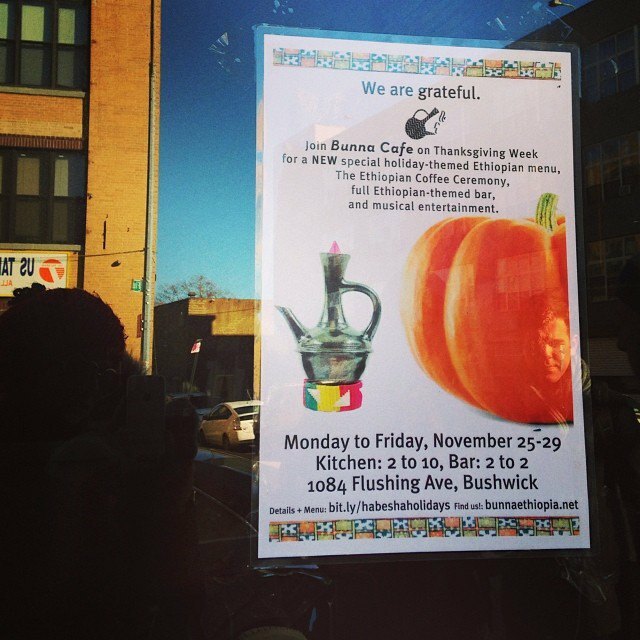 Photo from Bushwick Daily's Instragram. Everyone knows how great Bunna Cafe is at this point, and making the situation even better, the pop up restaurant has taken over Mama Joy's space across from the loom (at least temporarily). They are sharing their "everything is eshi" (it's all good) vibes this Thanksgiving week and will be serving every day up to Saturday. Their menu has a little something for everyone (and especially vegetarians and vegans looking for a meatless feast), including some seasonal new dishes, like inguday tibs (portobello mushroom sauteed in berbere, garlic, ginger, and onion) and duba wot (sweet pumpkin cubes cooked with spicy berbere sauce). 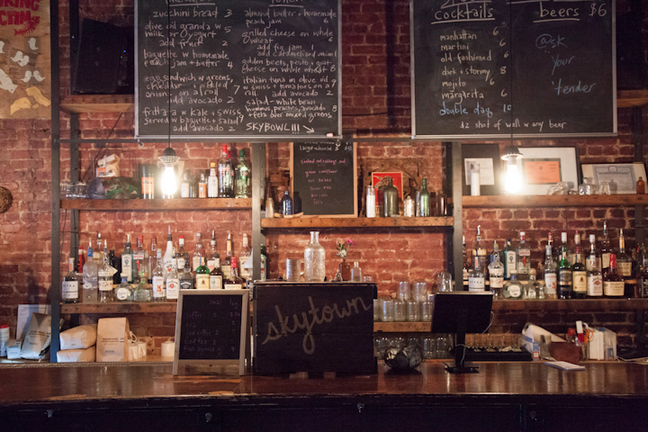 Friends are friends are friends @ Skytown. Photo by Katarina Hybenova. Everyone who's anyone moves to New York and then if they don't move back home sad, disappointed, and broken hearted, they meet five hilarious, attractive friends and spend all the secular holidays dropping sarcastic one liners and reminiscing about college. Well, now no one even has to make grilled cheese sandwiches. Skytown's selling a three-course buffet with a carving station for only twenty bucks! Missing your family's homemade baked goods this holiday but are miles and miles away? Fret not! Cafe Norma's has got your back. Their baked goods selection is rotating but one thing is for certain - all of it is wonderful! From raspberry-blueberry muffins, to citrus glazed mini pumpkin bundt cakes, to brownies and even gluten-free cupcakes, Cafe Norma's will give you that "fresh from the oven" feeling without having to slave in the kitchen. 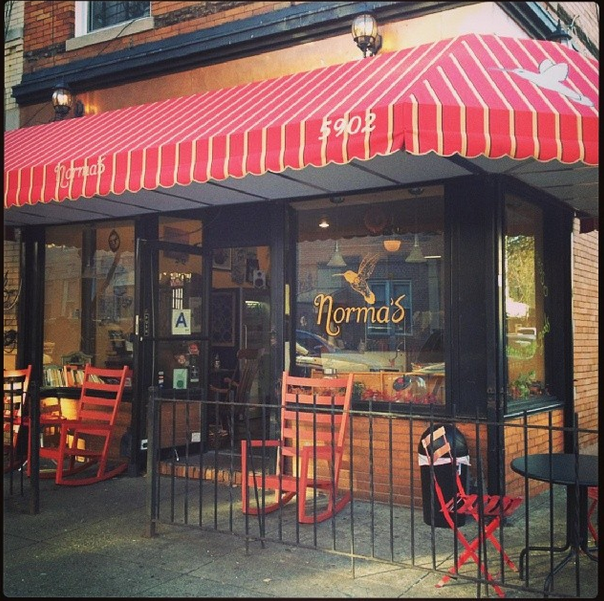 Cafe Norma's is usually open Mon-Sun 7am-9pm, but is open this Thanksgiving 7am-2pm, which is perfect if you are looking to spend a cozy, low-key Thanksgiving afternoon with a pumpkin latte and some garden cake (carrot, zucchini, beet and pecan loaf). Cafe Norma's also takes care of your catering needs so if you need to place a pie order give them a call!